New low-effort control levers, steering wheel and steering lever, plus larger, more comfortable cab offer a significant improvement in operator comfort and visibility. Equipped with an EPA Tier 4 Final certified emissions regulations-compliant engine, the GD655-7 - Komatsu America Corp.'s latest addition to the motor grader lineup - will be sold concurrently with the current GD655-6 model to offer customers additional choices to meet their needs. "The GD655-7 provides operators with an all new, ergonomic working environment and the new spacious cab allows more room for operators working long days" said Bruce Boebel, senior product manager, Komatsu America. "Operators will appreciate the new low-effort equipment and steering levers, new transmission controls and articulation stop-at-center feature. Collectively, they significantly reduce operator fatigue," Boebel said. New multi-position adjustable arm rests and LH/RH consoles have power raise/lower and mechanical fore/aft adjustments to precisely adjust to operator preferences. All Komatsu GD655-7 units come with Komatsu CARE. Komatsu CARE provides scheduled factory maintenance for the first 2,000 hours or three years including a 50-point inspection at each service, and two complimentary KDPF exchanges in the first five years. Bobcat has launched the world's first 1 tonne electric mini-excavator at Bauma 2019. Combining zero emissions, low noise and a width of just 71 cm, Bobcat's new E10e battery-powered, zero tail swing (ZTS) mini-excavator can easily pass through standard doors and in and out of lifts, making it ideal for indoor applications such as demolition and basement construction. Bobcat is launching a new Remote Control system for Bobcat compact loaders. This system allows operators to leave their seat in the cab and control their Bobcat loader remotely. It is compatible with Bobcat skid-steer, compact track and all wheel steer loader models equipped with the company's Selectable Joystick Controls. Bobcat is the first manufacturer to introduce a Remote Control System as original ‘Plug&Play' equipment, rather than offering it as an add-on development from a third party. The new system will be commercially available later this year. John Deere Construction and Forestry is decreasing its annual JDLink Ultimate offering prices, providing customers with an affordable, streamlined data solution that boosts productivity and maximizes uptime. Additionally, the division is consolidating JDLink Ultimate Forestry with the larger JDLink offering. At Bauma 2019, Liebherr presented a comprehensive range of intelligent assistance systems for selected wheel loaders from the corporate group. These include, for example, active rear person recognition, front area monitoring and the Skyview 360° camera system. 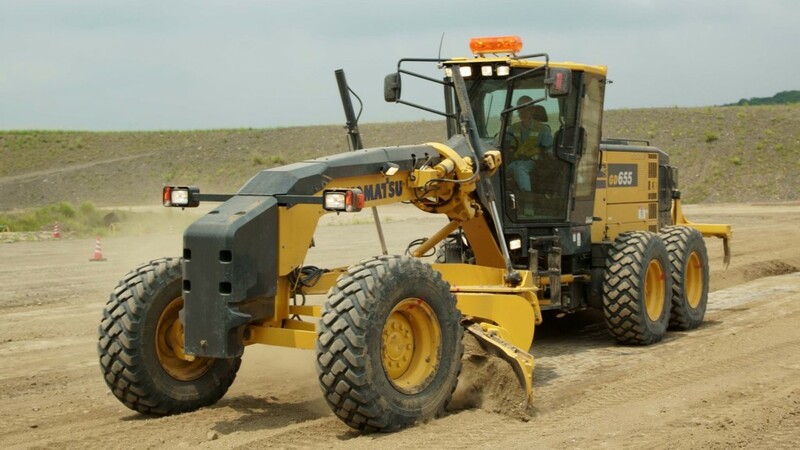 These solutions increase safety and reduce the burden on the machine operator, whose everyday work with the wheel loader brings with it a significant weight of responsibility. Another assistance system is the new weighing device, which functions as a control scale over a large lifting range. All the new assistance systems have been developed by Liebherr and are therefore fully integrated into the machine control. This also applies to the new joystick steering for models from the L 526 to the L 586 XPower. The intuitive operation of the joystick enables the operator to steer accurately and without fatigue, as its position always corresponds to the wheel loader's current articulation angle. Since the beginning of the year, Liebherr has launched seven crawler excavator models under 50 tonnes. The R 930, the mid-weight model of the series, is a brand new Liebherr crawler excavator for earthmoving works. At Bauma 2019, Liebherr introduced its generation 8 crawler tractors with the new PR 736 G8. Equipped with many new developments for even more operator comfort, excellent grading characteristics and the new standard grading systems, the PR 736 G8 is a do-it-all machine for grading and mining use. Following extensive research and innovation in partnership with German engine manufacturer Deutz AG, Kobelco Construction Machinery Europe B.V. has announced the launch of its first electric mini excavator concept. The arrival of the Kobelco Electric powered 17SR comes just three years after the European introduction of the pioneering SK210HLC-10 Hybrid excavator, and further reinforces the Japanese manufacturer's strategy of reducing its environmental impact. The Kobelco electric-powered 17SR concept can be seen for the first time at bauma 2019. FPT Industrial is sustainably powering the new Natural Gas (NG) Methane-Powered Wheel Loader Concept – Project TETRA from Case Construction Equipment, presented at bauma 2019, in Munich, Germany. The EC200E, which made its debut at bauma, gives a new choice for contractors and rental companies who want Volvo quality with exceptional value in light to medium applications. Terex Trucks' 28-tonne upgraded TA300 articulated hauler is making its first international trade show appearance and taking pride of place on the company's stand at bauma Munich 2019. Trimble and Doosan Infracore North America, LLC have announced the availability of Trimble LOADRITE L3180 SmartScale as an option on Doosan wheel loaders. Find out what's built into Volvo CE's 20-ton-class excavator, including ground-level servicing, industry-best cab and the quality Volvo durability and design that continues to win over new customers. The Mecalac Swing loader, which the company says is quick and highly efficient, is designed to provide top performance on all construction sites. Volvo Construction Equipment has unveiled two zero-emissions machines – the ECR25 excavator and L25 wheel loader – from its new range of electric compact machines. Case's all-new TV450 compact track loader is a 10,610-pound vertical-lift machine with a rated operating capacity of 4,500 pounds at 50 percent tipping load. The largest Case CTL ever built features 9,188 pounds of breakout force, and optional high-flow (3,450 psi at 39.5 gpm) and enhanced high-flow (4,000 psi at 35 gpm) hydraulics for high-power attachments such as mulching heads, stump grinders and cold planers. The new Gehl RT255 Pilot Series track loader features an exclusive seat-mounted joystick, automatic track tensioning and top rated hydraulic flow rates promising to deliver maximum performanceand versatility to the job site. These all new compact loaders from John Deere feature their Articulation Plus Steering System, a new loader arm and coupler design, and speeds that make for some pretty quick moves. Add in the 324L's optional High-Lift configuration, and these compact loaders could make a significant contribution to a company's bottom line. John Deere will be exhibiting a selection of its construction equipment – including motor graders that will be sold via the Wirtgen Group's German sales and service companies and via the French sales and service company Wirtgen France SAS – at bauma from April 8 to 14, 2019. A total of 14 John Deere machines will be on display for the first time at the Wirtgen Group booth. John Deere acquired the Wirtgen Group in December 2017. KOBELCO Construction Machinery USA continues to provide customers with quality products from its North American manufacturing facility in Moore, SC. KOBELCO recently produced its 1000th excavator at the USA facility and celebrated the milestone by hosting a ceremony on March 27, 2019. Hitachi is introducing the EX2600-7 and EX5600-7 mining excavators, which deliver enhanced efficiency, reliability and durability, to North and South America. These models are part of the new EX-7 Series line of mining excavators, which highlights Hitachi's focus on continuous improvement through fuel-efficiency technologies and advanced engineering. Caterpillar and its German dealer, Zeppelin Baumaschinen GmbH, will exhibit a wide range of equipment, technology, and services at bauma Munich, April 8–14, 2019. Rewrite the Rules is the Caterpillar theme, and the company says that displays will emphasize the renewed efficiencies and profitability that equipment users gain when partnering with Caterpillar – a partner providing customers the widest choice of machines, the best connectivity for managing machines and the jobsite, and the most advanced technology for increasing fuel efficiency. Caterpillar resources empower and encourage customers to "rewrite the rules" for their businesses. Aimed at one of the most competitive segments of the excavator market, Volvo Construction Equipment's (Volvo CE) new EC200E crawler excavator is the perfect partner for a wide range of medium-duty applications. The 20-ton model is a purpose-built machine whose specifications position it between the company's existing EC220E and EC180E units in the EMEA region. Ideal for in-house operations or as part of a rental fleet, and suitable for construction, utilities, road infrastructure and more, Volvo says that the EC200E provides superior performance with excellent value, ensuring high customer profitability. The new Cat 777G off-highway truck builds on the legacy of performance, reliability, and long-term durability established by 777 models since 1977, both in mining and large earthmoving applications. Volvo Construction Equipment has updated its G-Series articulated hauler range. New features include cruise control, downhill speed control and OptiShift, all reinforcing the G-Series' position as the number one choice for operators. John Deere is rolling out its new construction simulators - further bridging the gap between the classroom and jobsite. The modular update outfits the new John Deere simulators to one of six machine types: backhoe, crawler dozer, excavator, wheel loader, joystick-controlled motor grader and fingertip control motor grader. The Moss family has been installing utilities in the Dallas-Fort Worth (DFW) metroplex for almost a century. The fourth-generation family-owned business, Moss Construction Co., was founded in 1989 and became one of the largest utility contracting companies in DFW of its time. The business continued to thrive until 2008, when it was forced to close its doors due to the economic downturn. Wacker Neuson is introducing a new line of mini track dumpers. The DT series (Dumper Track) will be available in three models with various skip options making them ideal material handling solutions for smaller jobs that need the advantages of a tracked machine. They are designed for smooth travel while maneuvering across rough terrain and in confined areas. Berkim Construction is constructing the new Canada Post sorting facility in Burlington, Ontario. The family-owned construction company, which specializes in small-to-medium-sized projects like this one, brought the first equipment on site last October and expects to have the work completed by July. "A lot of work is subbed out – formworks, steel erectors, steel manufacturers, earthworks," says Alex Monteleone, site supervisor, Berkim Construction. To perform the earthworks, the company hired MGI Construction Corp.
Skid-steer loaders are nimble, versatile machines capable of performing a variety of jobsite tasks. Although skid steers have recently been overshadowed by the higher growth in demand for tracked machines, our experts emphasize that skid steers offer a number of advantages that are not to be overlooked, including speed, transportability and cost of ownership. Wacker Neuson continues to optimize its excavator line with the addition of two models that are built for operator comfort, stability, power and serviceability. The 3.6-ton EZ36 and 2.6-ton EZ26, compact excavators with a minimal tail swing design are versatile machines for a variety of applications. Wacker Neuson's dual-view dumpers bring a new perspective to material handling. The unique concept allows the entire operator's console to swivel 180 degrees so the operator is always facing the task. Available in North America later in 2019, the DV series of dumpers provide optimal visibility, regardless of the working direction or payload size. The completely new 800 series is the largest and most powerful loader series from the Finnish manufacturer Avant Tecno. It pushes the limits of compact loader's performance with 4,256-pound lift capacity and 11.5 feet lift height. Still, its dimensions – width 5 feet, length 11 feet, height 8 feet and weight starting from 5,500 pounds – and articulated design make the 800 series a very versatile and powerful compact loader. ASV Holdings Inc. has introduced a new radial-lift RT-65 Posi-Track compact track loader. ASV says that they have built the loader with maximum serviceability, reliability, productivity and ASV's patented Posi-Track undercarriage for superior performance. The CTL is ideal for digging and ground engagement work in construction, excavation, landscaping, snow-clearing and rental applications. Material handling takes on a new dimension with Wacker Neuson's newest wheel loader, the WL95. The new 2-yard articulated wheel loader is the company's first heavy-duty model to be introduced in this size class and is the largest in Wacker Neuson's extensive fleet of wheel loaders. The WL95 offers performance with a high payload that allows operators to load, move and place more material efficiently. Wacker Neuson's new Certified Pre-owned (CPO) equipment program takes used equipment to a new level. The CPO program allows end users to purchase premium products at an affordable price with the same confidence as if purchasing a new piece of equipment. The 2019 product update package for Cat M Series Medium Wheel Loaders (950M - 982M) includes technology advances that provide: lower operating costs via extended service intervals; enhanced operator comfort with new seats and suspensions; emissions control strategies to meet EU Stage V standards (EU only); added machine configurations (982M Forestry Machine and 982M High Lift); expanded productivity measurement tools; remote software update capability; and refinements in ground engaging tool and coupler systems. Kubota Canada Ltd. is adding to its compact track loaders series by introducing the new the SVL65-2. The new compact track loader is positioned in a lighter rated operating capacity weight class than the current SVL75-2 and the SVL95-2 models, further diversifying its construction and landscaping equipment offerings. The new unit will be available in Kubota dealerships across Canada starting April 15, 2019. John Deere is introducing two popular G-Series Motor Graders to the European market via the Wirtgen Group distribution network in Germany and France. The 622GP and 672GP will be available in these two countries beginning in early 2019.